In photography, the term monochrome is often equated with black and white. However, if one looks at the root of the word, it can clearly apply not only to images that are black and white, but also to pictures that are, for all intents and purposes, just one color. I tend to find such images very interesting. To me, they always seem to be very moody and emotive. I also find that, for some reason, my feelings about individual images of this genre tend to be rather strong; I either really like them or really do not care for them at all. I have noticed that a good many of these types of images tend to be fashion photographs. But I also have seen monochrome used in this way, to a lesser extent, with landscapes, as well as with almost every other kind of photograph. It is a presentation that I don’t use very frequently because I just don’t find that many of my images are, for lack of a better term, harmonious with this technique. But, every once in a while, I find that there is a photograph that seems to work well with the monochromatic presentation. When this is the case, it seems to be very obvious from the start. 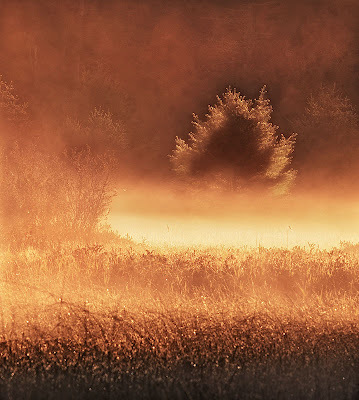 This image was taken in a bog at sunrise. At the time, the whole landscape seemed very magical. It was one of those images where the monochromatic approach seemed to fit from the start. The color seemed to complement the image, allowing it to convey the beauty of the landscape bathed in the light of the rising sun. If your feelings about these types of images are similar to mine, you probably find that the photo is either quite striking or that you strongly dislike it. The idea of ‘monochromatic color’ doesn’t seem to work all that often for me, but when it does, it really seems to resonate. I think that, when scanning through one’s images, it might be a worthwhile idea to keep alert for situations where this type of presentation might be applicable. It could make for some interesting images. Images that people will likely either love or hate.